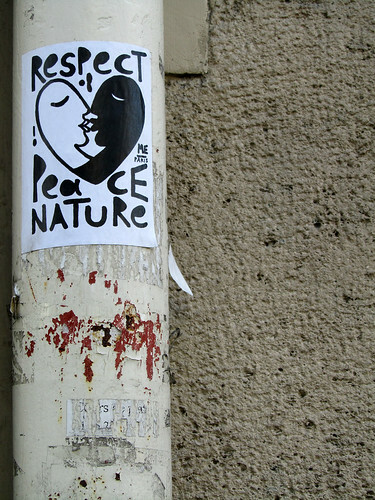 … love, peace and nature. I don’t know if it’s me paying way too much attention at random things, or if it just happens that there are a lot of notices posted on public poles lately. And most of them tend to run along the vein of massage service offered so please rip one of these phone number strips below. Yes, if you are wondering, there are people who take those numbers. It is therefore refreshing to see a different kind of note. One with positive message of respect and tolerance, one designed to make you take a minute to reflect on its message. Perhaps it’s an aesthetique thing, but I like the representation that love transcends race. In this increasingly mobile and cosmopolitan world, relationships are certainly stretched beyond country and cultural boundary. Such transformation can only enhance our lives and the way we see the world and its people. I’d say, keep it up! oh yeah, i saw those. and worse is the poor trees that have got staplers all over them. ouch!